If buying a table saw seems a challenging task, knowing how to use it is no less tricky for many woodworkers who might have failed to explore its versatility. This is due to the fact that a lot of users are not aware as to how to use a table saw. Using a table saw effectively is based on the knowledge of it that you have. So in this discussion, we shall be going through the various parts of a table saw and how the function. We shall also be examining different kinds of cuts and how to effect them. We will round up with providing some safety usage tips and the need for maintaining the table saw to keep it working effectively. Knowing how to use a table saw is not an impossible task, but you need to know the parts and how each part function to deliver consistent performance for different projects. Understanding the individual functioning of the various parts of a table saw aids your knowledge of the overall function. When you know the parts, you will definitely know how to maximize these various parts for any given woodworking task. The table saw has various parts and components all of which you have to be familiar with if you truly want to know how to use a table saw properly. We shall be looking briefly at a number of these parts and how they function below. The table is the smooth surface upon which the saw lies. This table provides a base for woodworking pieces to lie while they are moved through the saw for accurate cuts. While some tables are larger, others are of a medium size depending on the type of table saw you are using. This fence is a guide which is usually long and parallel to the table saw’s blade The fence of the saw helps to ensure that the piece to be cut is at a reasonable distance from the spinning blade while stopping the cut. To ensure that the fence is everything in place, the fenced dog is a lever that keeps the fence locked and intact always. Tightly press the fenced dog down helps to secure it well in place. The blade of the table saw is no doubt the most important of all the parts. It not only does all the work, but the accuracy of the result is based on the strength of the blade. The blade comes in different styles to suit the particular type of blade saw being used. The blade insert is that part of the table saw that fills the whole used for blade switching. It comes in different gap sizes which also depends on the type of table saw. This part is what makes it easy for the woodworker to adjust the height of the table saw’s blade to suit the purpose for which it is to serve. The blade angle adjustment wheel allows the user to adjust the blade’s angle and make it aligned to the table. The angle indicator this part comes with makes it a whole lot easier to use. Coming as a hinged push-pull button in modern table saws, the power button is what makes it easy for you to be able to put the table saw on when needed and off when not in use. There are a number of cuts that can be effected with the use of a table saw. With professionals coming up with some, there are cuts that have established themselves as the common cuts table saws are being used for and that is what we shall be examining briefly. The crosscut is a cut carried out across the grain. To effect this cut, you will need to make use of the sled of the table saw. You can also make use of the miter gauge and make sure it is well aligned to the fence. The ripping cut goes through the length of the board or workpiece. This cut is very simple to carry out and can be done by making use of the fence. Here the fence is used as a guide to the cut you’d like to be effected. This is a cut more familiar to jointers than it is to woodworkers. To effect this cut, you can also make use of one of either the fence or the miter gauge but not both. Also it is important to note that dado cuts are effectively produced when you make use of blades designed specifically for it. How to Adjust the Blade Height? Adjusting or setting the blade height properly can be done in two different ways depending on which one you are comfortable with as the user. The first approach will help in setting the blade a little higher above the wood you are working on. This helps to prevent your fingers from coming in contact with the blade. To do this, you will need to loosen the arbor nut that holds the blade in place and raise the blade a bit then tighten the nut back in place. The second way will have you setting the blade at a height that is far above the workpiece. While this approach helps in reducing tear out and fraying of the wood, it is very dangerous as your fingers can be damaged while working if not extra careful. Experience and skill are most needed for any woodworker who intends to make use of this blade adjustment method. Just like blade adjustments, angled cuts can be made in two different ways too. First, you will have to set the miter gauge being relative to the plane of the blade. Also, you will have to set the desired angle you want before carrying on with the regular cut. The next way is to tilt the table while making the cut. Tilting the table towards the angle you desire the cut to be is another way to achieve angled cuts with the table saw. How to Adjust the Fence? With the fence already explained as a part of the table saw above, how can one effectively adjust the fence of a table saw? It is simple, all you need to do is to adjust it from the fenced dog. Since the fenced dog is what holds the fence in place, you just need to loosen it a bit. When you do, you are able to change the width of the cut after which you will fasten the lever back. How to Change the Blades and Inserts? It is possible that after a while of using the table saw, the need for changing the blades and the inserts might arise. Knowing how to change the blades and inserts before the needs arise puts you at an advantage whilst also saving you some costs. Here is how to change the blades and inserts of your table saw. When changing the inserts, you will do so from the front of the table. Lifting the front, and then making use of the table at the back of the table gives you access to the insert and makes it easy to change. Changing the blade of the table saw requires that remove the insert first. To do this, you will need to first adjust the height of the blade, and takeout the insert. Loosen the nut that holds the blade in place and removes the current blade. Replace the new blade, fasten the arbor nut, replace the insert and adjust the height again. How to Do the Cutting? Crosscuts and ripping are the most common types of cuts known to woodworkers and being carried out with a table saw. So to make the most out of a table saw when cutting, you have to be familiar with how to effect these two types of cuts. Crosscuts can be done using a table saw. This is very simple provided you know the steps to be followed to do crosscuts. For woodworkers who do not know these steps, they have been provided below. To start with, pick the right tool and measure it appropriately taking notes with a mark where needed. Avoid making use of both the miter gauge and the fence right at the same time to prevent inaccurate binding. After measuring and marking the tool, go on to set the height of the blade in line with the marks you made. Switch on the table saw and pass the workpiece through it carefully as you hold the board firmly in place. As a woodworker who wants to carry out a ripping cut, and has been wondering how to go about it, here is how to rip. First, make sure you have the blade height and fence adjusted. Then go on to turn on the saw sand put the furniture to be ripped against the fence. Avoid making use of excessive force as the workpiece is placed against the fence. Gradually push the board through the saw as the saw rips it. Putt off the table saw as soon as ripping is completed. How to Maximize Your Advantages with a Table Saw? Maximizing your advantage with a table saw means that you explore the versatile nature of the table saw by using it for a number of projects. Projects that the table saw can be used for include the box joint jig, the jointer jig and the tapering jig among others. Your table saw can be used to make a finger/box joint with the use of a simple jig. These box joints are known to be a highly effective and very strong joint. It is also possible for you to use your table saw like a jointer. With this, you are able to easily joint the timber edges the same way a jointer would do so. The tapering jig makes it easy for you to cut a taper. 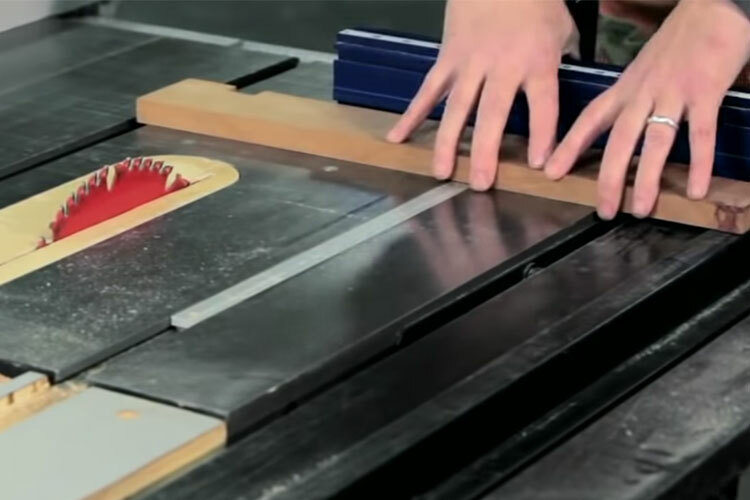 This is a cool trick that can be carried out with the use of your table saw. Just find the right version of jig to buy and you will be able to easily cut a taper on your table saw. Do not be afraid while making use of the table as fear itself can cause you to miss any of the steps and result in a hazard. Do not let your fingers or hands come in the way while making use of the table saw as it can totally damage the. Wear protective glasses and gloves while operating with a table saw to shield this sharp tool from harming any part of your body. Store table saw safely after use to be sure it is kept out of the reach of children at all times. How to Take Care of the Saw? It doesn’t matter as to whether it is a table saw for home use or one in your woodworking shop, maintenance is very important. Through regular maintenance, you are able to ensure the table saw’s high performance is secured all the time. Regular maintenance also helps to save you some cost timely breakdown might cause. Let’s look out how to take care of the saw under the two headings if cleaning the saw and keeping it free of rust. Cleaning the saw regular is very important and this should happen before and after every use. When cleaning the table saw, make sure to disassemble it carefully taking the blade away. Make use of dry sackcloth to clean the various parts of the table saw. Wipe the blade with a lint free cloth and you can also make use of a spray for effective cleaning. Keeping the table saw free from rust is also very necessary to maintain it at all times. After every use of the table saw, or based on the maintenance plan you have prepared you should be careful what you use in cleaning it. Do not make use of a wet cloth to clean the blade or any part of the table saw. Make use of dry clothes and air blower to take away dirt and dust from the table saw. It is not enough to know how to use a table saw, most importantly is to know how to use it properly. Table saws are an excellent woodworking tool used in achieving accurate cuts easily. However, safety while using the saw helps to ensure that you do not fall victim or expose yourself to any of the incidents likely to occur. Just like staying safe is good when using a table saw, maintenance is best to keep the tool working always. With all the relevant information needed to safely make use of the table saw and maintain it properly already provided, read through carefully for understanding. 2 How Does a Wood Jointer Work? Learn the Mechanism Behind It! 9 How to Use a Scroll Saw for Some Intricate Woodworking Tasks?